Following a recent post about increasing productivity at work, I received so many great strategies and suggestions about how you – my wonderful readers – enhance your productivity everyday. From clearing clutter, to having potted plants in the office, and setting boundaries with friends and family, to working in the perfect temperature, each of you had fantastic tips and tricks about what motivates you. Check out my Minimalist’s Guide to Minimalism for tips on clearing clutter. Read about the benefits of incorporating plants in your home here. Learn how to set work boundaries with friends, family, and neighbors here. Today, however, I would like to dive deep into a problem that plagues many of us throughout the work day. It has a constant presence in our lives, and it’s not going anywhere soon. And that major stumbling block is the internet. Yes, today we are tackling the internet. Because while it has been one of the greatest innovations in modern history, it also brings with it many challenges. For many of us, the bulk of our work requires the internet in some form or another. Whether we’re emailing colleagues, posting readings for our students, advertising products, or simply doing research, the internet is an indispensable tool in our daily lives. 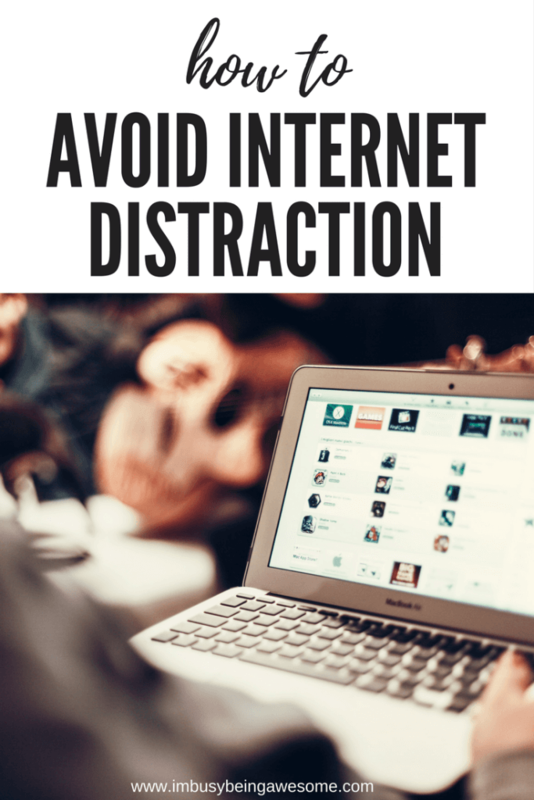 Unfortunately, the internet is also a major distraction and convenient means for procrastination. So what’s a modern, 21st century person to do? Obviously we cannot simply avoid the technology. And I’m willing to bet most of us wouldn’t want to. But we do need some realistic strategies to help us avoid internet distraction. 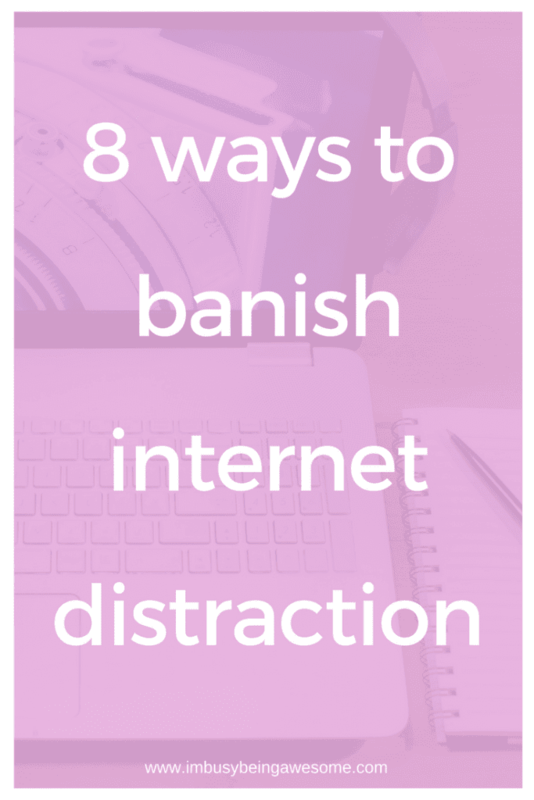 So today I’m sharing with you my top eight ways to avoid internet distraction. The first thing to do is spend a week or so recording which websites you visit, how frequently you visit them, and how long you’re staying each time. You can do this the old fashioned way, by simply recording your time with a pad and pen. But this can be a bit time consuming in itself. Especially if you’re really battling internet distraction and constantly jumping from one website to the next. The most helpful solution I’ve found using a program called RescueTime. It is an application for your computer and/or phone. And it shows you where you spend your time throughout the day regarding various websites, email servers, and social media platforms. Let me tell you… seeing this information in a clear graph is certainly a wake-up call. You quickly recognize where your times goes each day, which helps you retake control and find a balance that works for you. If you’re interested in checking out this site (it’s free!) head to their page here. Once you have identified your time-wasting websites, consider using a website blocker during the work day. There are many different options out there, but they all work about the same. First, you select the problematic sites that waste your time. And then the website blocker prevents you from checking them. It’s as simple as that! Depending on the program, you might simply turn the blocker on and off. (Google Chrome has a free extension called WorkMode, which blocks all social media websites with a click of a button.) While others allow you to set set a specific time to block the sites (i.e. block Facebook between 9-4) etc. RescueTime has a built in website blocker that I find particularly effective, especially since the program already tracks my productivity and key distraction websites. When I’m at work, however, I’ve adopted the practice of using one single tab and entering full-screen mode. Each program has a full-screen option, and it’s usually somewhere in the top right or left corner of the page. I know this sounds like a simple strategy, but sometimes simple is the most effective. So try it! Go full screen. I think you’ll be amazed at the difference this small change makes. When I used to get the urge to check for something on Amazon, look for a quick dinner recipe, or send off a non-urgent email, I would often stop what I was doing and immediately shift gears. I was like a kid in a toy shop jumping from one shiny thing to the next. It was awful. Recently, however, I’ve started keeping a pad of paper next to me. Now whenever these urges strike, I simply jot down the idea, and I tell myself I can check the site/send the email during my next break. For some reason, the mere act of writing down the task is enough to silence the distraction. Then I can get back to work. Again, it’s a simple strategy that yields big results. I’m a big believer in scheduling breaks throughout the day. It gives your brain a break, which, in turn, allows for greater productivity when you return to the task. Along a similar vein, it’s also important to schedule time for email. Admittedly, this is a task that I’m still working on myself. I still feel that uncontrollable urge to continually check my email, and I still catch myself checking my work and personal emails far too often. I am trying, however, to limit this checking to twice during the work day. Once mid morning, and again in the mid afternoon. On the days that I’m able to successfully follow this strategy, I am always amazed at the amount of work I accomplish. And following the schedule has gotten easier with each day I practice, which is quite motivating; I’m not giving up any time soon. With that said, if you have any suggestions for following an email-checking schedule, I’d love to hear them! I turned off notifications on both my phone and my email about 6 months ago. I had just started a new job, and I figured it would be a good time for me to kickstart this new strategy. And I can’t tell you how helpful this simple hack has been. As I’ve mentioned before, each ping, vibrate, and pop-up, causes us to break our focus. And when these alerts happen consistently throughout the day, our productivity nosedives. By silencing these alerts and only checking sites at specific times of the day, however, we avoid that constant distraction. This is more of an old-school approach, but it’s certainly an effective one. Since most of our computers are connected wirelessly these days, you can simply turn off your computer’s wi-fi, which completely prevents you from using your internet. While this is not always effective for those who need the internet for work, it is incredibly helpful for “off-line” work. Finally, you might consider using one browser for work purposes and a different browser for your personal life. For example, I use Google Chrome for all of my personal and blogging related tasks, and Safari solely for my job. I only bookmark work-related items in Safari, and I do not log into any social media or shopping websites. (I’m looking at you, Amazon). By removing the convenience of quick bookmarks and logged-in social media accounts with Safari, I’m successfully sidestepping distracting stumbling blocks and getting more done throughout the day. Woohoo! 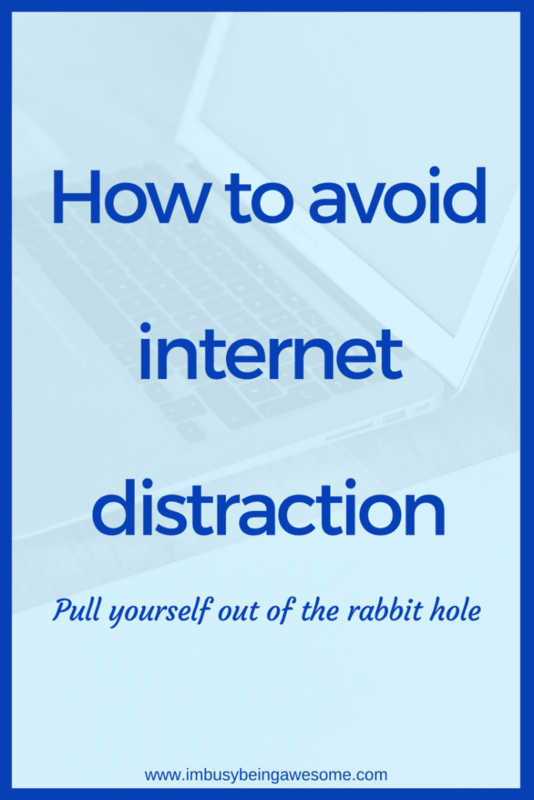 How do you avoid internet distraction? Do you have any easy strategies to share? What are some internet hurdles that you face? Will you try any of the strategies listed above? Let me know below! Awesome tips! I’m so bad about getting distracted and wasting time online. It’s such a battle! These are such great tips! I’m definitely guilty of this! Thank you for sharing! This is a solid list and all things I should be doing when trying to work! Thanks for sharing. Absolutely- I hope they help! Great tips! I am multi tab kind of a girl too and it can be so distracting! I really enjoyed this read and am totally guilty of this distraction at times. I have all my notifications turned off on my phone at all times (except for texts) so this definitely helps.